NOTE: I was provided with an ARC of this book from the author because he’s a wonderful human being. Do you ever read a book so good that when you turn the last page, you just clutch it to your chest and hold it for a bit? And how often do you realize, as you hold the book, that you’ve just read something that has now firmly positioned itself on your favorites shelf? That’s The Serpent King for me. I haven’t had this much of an emotional reaction to a book in a long time. I mean, I full-on sobbed at one point. I literally had to get up from the table (I was on my lunch break at work) and LEAVE the building to get some fresh air. 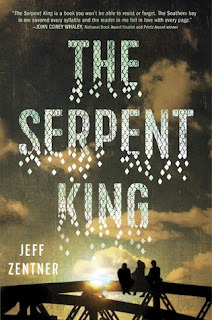 The Serpent King is one that will stick with you for a long time, and it’s been months since I read it and I still can’t get it out of my head. It’s beautiful, heartbreaking, real (SO real), and absolutely lovely. I don’t want to go into the specifics of the plot because I think you should just read it, but I do want to mention the characters. I think it’s the mark of a great author when the characters they create feel like they could walk out of the book and shake your hand. I could relate to all three of the main characters – Lydia, Dill, and Travis – in different ways. Jeff has perfectly captured Lydia’s desire to move, to get out into the world, and leave everything she’s ever known. Travis’ passion and love of his favorite book series will resonate with all of us. And with Dill? What it means to be human. The bottom line: Read this book to meet characters that feel like real people. Read this book because we’ve all fought for the hope of a better life. Read this book to feel – alive, human, hopeful, heartbroken. Read this book because you’re human. Riley Cavanaugh is the child of a congressman running for reelection, so the pressure has always been on to be a model teen. The problem is, Riley isn’t exactly what the conservative South Orange county would call “model.” Riley is sarcastic, rebellious, and gender fluid, meaning some days, Riley feels like a boy. Others, Riley feels like a girl. No one else knows except Riley’s therapist, who encourages Riley to start a blog to work through the feelings and potentially overcome some of the more harmful ones. Riley finds the blogging therapeutic—that is, until the blog goes viral, and someone from school threatens to out Riley to the world, as well as threatening Riley’s life. Riley must make a choice—abandon the blog that has come to mean so much to a lot of people, including Riley, or stand up and face the world head on. I could not put this book down. It’s so well-written, and Riley’s voice feels so incredibly authentic. I felt for Riley, and the roller coaster Riley goes on is so captivating. Though the bulk of the story focuses on the struggles Riley is facing, be it bullying at school, the worry that Riley’s words carry too much weight with some of the blog’s followers, or the feelings Riley is developing for Bec, another outcast at school, Riley is so very fully-formed as a person. The same is true of all the characters in the book, actually. I love Bec, the mysterious and misunderstood (and delightfully funny) loner that Riley comes to have feelings for. Bec encourages, sometimes even indirectly, Riley to propel forward into this unknown territory of openness, but she’s not JUST there for Riley. Bec is her own person, too, and you see that in the writing. I LOVE Solo, Riley’s first friend at the school, who is a huge Samoan football player that is obsessed with Star Wars, and is generally just the greatest dude ever. I want him to give me a piggy back ride. PLEASE read this book. It’s so engrossing and beautiful and wonderful and I love everyone. Even the bullies at school have their own crap going on, but the narrative doesn’t excuse their behavior, just explains where it might have stemmed from, and I love that. I also like Riley’s parents and therapist. There are also bits sprinkled here and there about how everyone is so obsessed about knowing what parts (“Girl or boy? Yes.”) Riley has, and the book makes a point to never actually tell you, because that’s the point. It doesn’t matter. The outside doesn’t matter at all, it’s how Riley feels on any given day that matters. That's why I haven't used any pronouns in this whole review. I don't know which to use, and the book never says. Ugh, everything about this book is SO GREAT. Read it and let me know if you agree. 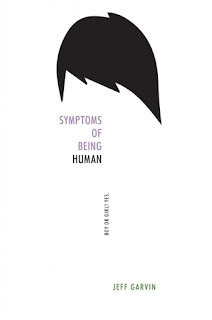 Want to check out Symptoms of Being Human? Find it on the CMRLS catalog and put it on hold!